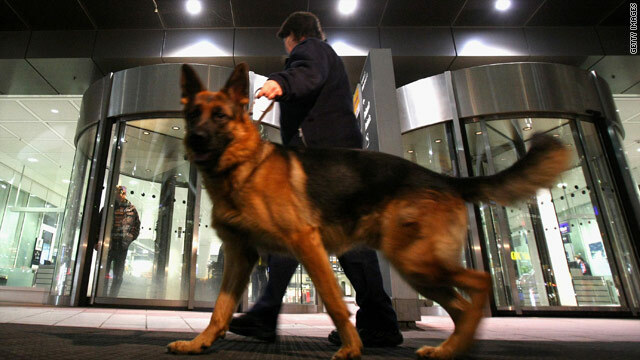 A security officer patrols with a sniffer dog at Munich Airport's Terminal 2 on Wednesday. Berlin, Germany (CNN) -- A bomb scare that affected about 100 flights at Munich Airport in Germany on Wednesday may have been a false alarm, German police told CNN. Police launched a huge manhunt Wednesday after a passenger appeared to flee from security officers when his laptop computer bag tested positive for explosives, they said. Police originally said authorities wanted to take the man in for further testing after his bag set off suspicions, but he ran. They said a bomb squad was testing the bag to see if it really contained explosives. But authorities later said the man may simply have been in a hurry, grabbed his things and left the airport. They do not have the laptop case, they said. They are still trying to find the man, they said, but are no longer describing the search as a huge manhunt. Police earlier said they were reviewing airport security videos to try to figure out where the man went. It was not clear if that was what caused them to change their evaluation of the situation. Police did not know which flight the man was booked on. Part of the airport was shut down after the suspect fled, but was later reopened. All planes in the area of Terminal 2, where the incident took place, were evacuated and all luggage was removed, police said. The passengers had to leave the secure area and be rescreened, an airport representative told CNN, adding that the airport was otherwise operating normally. About 100 flights were affected by the security measures. Some were canceled and others were delayed, the airport said, adding that activity has slowly begun to return to normal. The airport Web site was still showing some delays to flights leaving Terminal 2 several hours after the incident. The incident took place as a United States Senate committee debated the foiled Christmas Day attack aboard a plane bound from Amsterdam in the Netherlands to Detroit, Michigan. The committee chairman, Sen. Joseph Lieberman, I-Connecticut, said it is "infuriating" that the December 25 suspect, Nigerian Umar Farouk AbdulMutallab, was able to board the plane in the Netherlands with a U.S. visa. Janet Napolitano, secretary of homeland security, said AbdulMutallab "was not on the no-fly list, which would've flagged him to be prevented from boarding, nor was he on the selectee list, which would've flagged him for secondary screening." "Furthermore, the physical screening performed by foreign authorities at airports in Nigeria and the Netherlands did not detect explosives on his body," Napolitano said. "As this incident underscores, aviation security is increasingly an international responsibility." She said top Homeland Security Department officials are embarking on a multicontinent tour to meet with international counterparts about airline and airport security. She said she would leave Wednesday evening for Spain and a meeting with European Union officials. CNN's Frederik Pleitgen contributed to this report.